NASA’s Solar Dynamics Observatory spacecraft watched a massive solar coronal hole rotate into view as the Sun spun on its axis between Dec. 2 and 9, 2016. The coronal hole seen in this animation directed a stream of solar wind particles more or less directly toward Earth, triggering a minor geomagnetic storm on Friday, Dec. 9, 2016. A geomagnetic storm occurs when a period of high-speed solar wind transfers significant energy into Earth’s giant magnetic bubble, called the magnetosphere. This can trigger major changes in the currents, plasmas, and fields in the magnetosphere, resulting in beautiful auroras but also disruption to satellites and risks to power grids and pipelines on the ground. 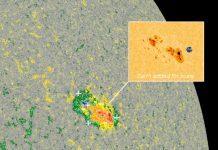 Such holes occur in areas of the solar atmosphere, called the corona, where the Sun’s magnetic field is open to space, rather than closed in on itself. This allows charged particles to stream out into space at high speed, lowering the density and temperature of material in the parts of the corona where this occurs. The result is a dark region in the corona when the Sun is viewed in x-ray wavelengths. 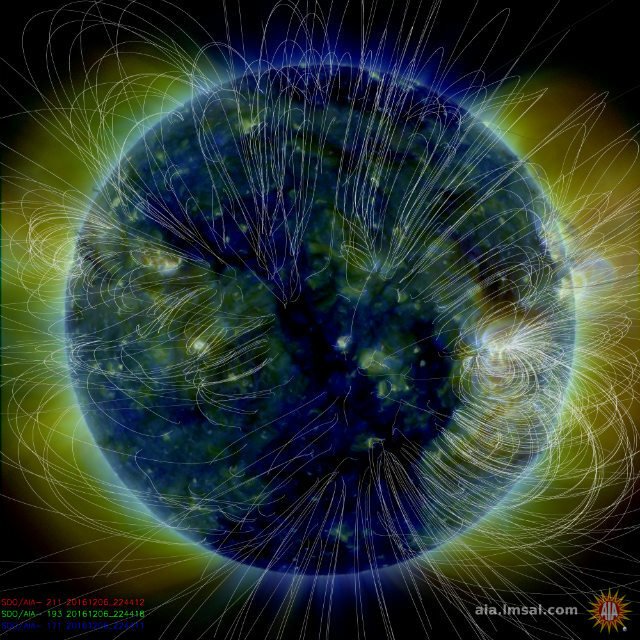 Charged particles spew from the Sun’s corona all the time, creating the solar wind. That’s because material in the corona is so hot, and therefore moving so energetically, that the Sun’s gravity cannot hold on to some of it. 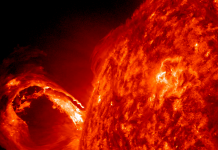 On average, the solar wind blows at a speed of about 1 million miles per hour (400 kilometers per second). But the wind emanating from coronal holes can blow at twice that velocity. 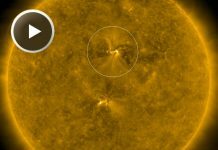 The coronal hole seen in this animation directed a stream of solar wind particles more or less directly toward Earth, triggering a minor geomagnetic storm on Friday, Dec. 9, 2016. A geomagnetic storm occurs when a period of high-speed solar wind transfers significant energy into Earth’s giant magnetic bubble, called the magnetosphere. This can trigger major changes in the currents, plasmas, and fields in the magnetosphere, resulting in beautiful auroras but also disruption to satellites and risks to power grids and pipelines on the ground.